First comes love, then comes marriage, then comes the baby in the baby carriage.In serious relationships, it's only a matter of time before you and your partner begin unwittingly auditioning for the role of parent to your future children. 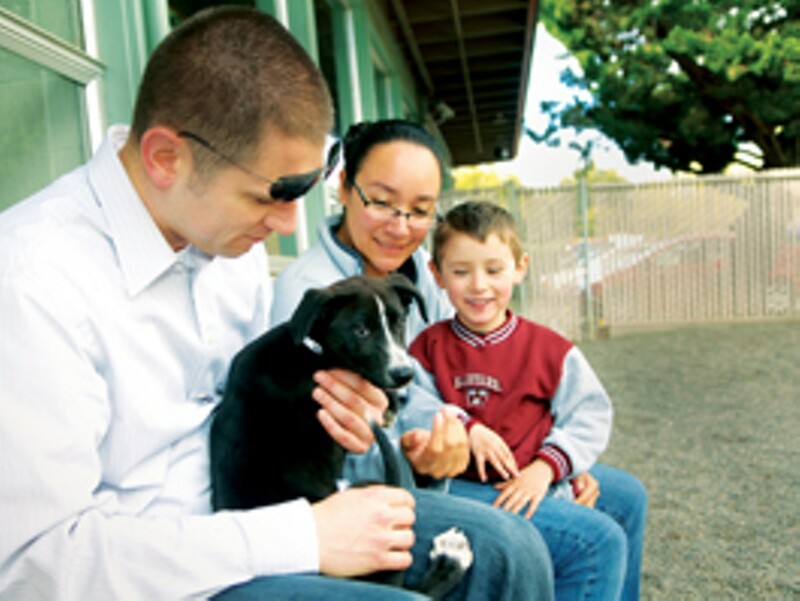 And there's no better place to start honing innate maternal/paternal instincts—or to explore the glaring deficiencies thereof—than at the Marin Humane Society, celebrating its 100th year of saving animals and finding them homes. "Our kennels and cages are always filled with adorable adoptables, and on weekends it's not unusual to do 20 to 30 adoptions," says Sheri Cardo, MHS' former director of public information (Cardo has since left the position). "Potential adopters appreciate coming to a shelter where there is a wide selection of wonderful animals and a good chance of finding 'the One.'" The Marin Humane Society doesn't take the adoption of its animals lightly, though pets are certainly easier to obtain than an actual baby. "It's our goal to make lifelong matches between people and pets, so we try to get a good idea of a family's lifestyle," Cardo says. "For example, we try to match high-energy dogs with athletic families, and more relaxed dogs with people who take life a little easier." I got the biggest surprise myself a few years back when I called my house from work one day. My fiancée and I had been in mourning at the passing of her 16-year-old Yorkie. With life's fleeting nature in full perspective, I was struggling to find meaning in the painful new plethora of free time that the dog's passing had opened. She was taking it as well as could be expected after 16 years of memories. We'd discussed another pet, but financial prudence, career demands and guilt about premature void-filling always won out.But I knew something was askew when she answered the phone that morning. I soon headed home, expecting another man in the house. And indeed, there was. When I opened the door, he jumped on me and proceeded to lick my face clean, with complete trust and friendly abandon. Apparently, my fiancée had been visiting the Humane Society for weeks until this little black Jack Russell mix with white spots stole her heart, urging her to begin the adoption process. He was found in the middle of a field in Napa, with much of his litter dead from the cold. I really can't tell you what she said after that, because I was busy playing with my new "son." Though it may be ridiculous to suggest this is similar to your newborn baby clutching your hand for the first time, it's the closest thing I've experienced yet. Years later, after countless joyous moments and the confirmation of having become "one of those weird dog people," I must say that day was one of the best surprises I've ever had. Maybe I'll even feel that way about a baby someday.The Marin Humane Society, 171 Bel Marin Keys, Novato. 415.883.4621.—D.S. Love hangs thick in the air, but the wallet is thin and the specter of payday is long off. Still, it doesn't take a superhero to find the perfect spot to snuggle up with your honey for dinner and a movie. Never fear, the Rio is here! 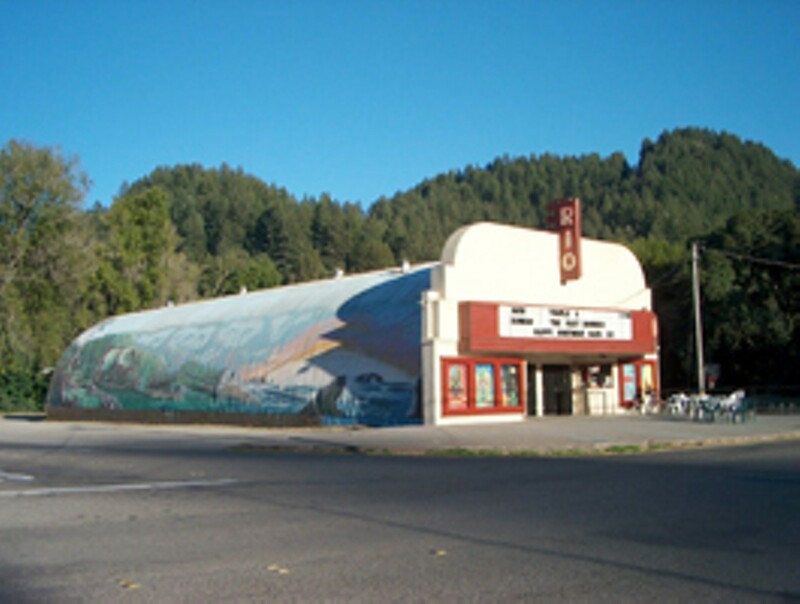 Located over the river and through the redwoods in downtown Monte Rio, the Rio Theater has been in business at its Quonset hut setting since 1950. Owners Don and Susi Schaffert screen current films five nights a week; replacing those annoying preshow ads are slide shows from trips Don's parents took in the '70s. The theater offers a dinner in a basket: a choice of eight different gourmet sausages (including vegetarian options) in a bun with condiments, a small popcorn or chips, and a 16-ounce soda. Eat inside while admiring the variety of painted murals depicting logging scenes, Star Wars villains and an angel spewing celestial discharge. The cushy seats are perfect for nestling in the dark, but be sure to bring a blanket, since the high-ceilinged Quonset never quite warms up. Dinner for two: $13. Cost of movie: $16. The look of love from your main squeeze: priceless. Rio Theater, 20396 Bohemian Hwy., Monte Rio. Films screen Wednesday&–Sunday at 7pm; matinees, Saturday&–Sunday at 4pm. 707.865.0913. —S.D. Once upon a time, in a land not very far away (OK, in Healdsburg), a starry-eyed couple strolled around the Old World beauty of Madrona Manor . The visit was intended to be a casual one, just a stop on a Sunday afternoon to see if perhaps the location was good for nuptials that had only been dreamily discussed. But after cruising up the loping driveway nestled between thickets of flowers, bushes and jewel-green lawns and catching sight of the buttercream yellow mansion, the couple's hearts began to sing a different tune, one that sounded strikingly similar to Pachelbel's Canon . By the time the car stopped, she knew they would be getting married there. Little did she know that a sly little engagement ring was already tucked away in his pocket. With magic thick in the air, they couldn't help but also fall in love with each of the mansion's stone urns cascading with wild flowers, the Victorian-style china plates and the thick expanses of emerald grass. The lovebirds flitted to the hilltop garden overlooking the grounds, and with a vision of Sonoma County vineyards floating lazily in periphery and a sweet little garden resting beneath their feet, he asked her to be his wife. She said yes. Had there ever been such golden happiness? She wanted to bottle up the moment and drink a little sip from it, every day. Madrona Manor, 1001 Westside Road, Healdsburg. New California cuisine prepared by chef Jesse Mallgren, Wednesday&–Saturday, 6pm to 9pm. 800.258.4003 .—B.H. We're always on the lookout for small, quaint, inexpensive places to rent for weddings. So how could we, in years past, have overlooked the Kenwood Depot? With a cozy main room (holds about a hundred), a redwood-tree-lined backyard patio (for dining) and an outdoor barbecue pit, it's the perfect romantic spot for tying the knot if you're opting for a low-key affair. Built in 1888 by famed architect Henry Hobson Richardson (builder of Boston's Trinity Church), the hall features a hardwood oak floor, a vineyard setting, an attached kitchen and a historic atmosphere quaintly suited to walking down the aisle. Especially attractive is the stonemasonry of the building, erected with large stones actually ripped from San Francisco's Market Street when said thoroughfare was revamped and shipped on a freight car to Kenwood, which at that time was despondently depot-less. Trains stopped running past the depot over 70 years ago, but thanks to the efforts of preservationists and the Kenwood Community Club, it's enjoyed new life. At a recent wedding, amidst toasts and polka dancing, two separate people reported having seen Van Morrison and Dan Hicks perform in the depot's small hall back in 1969. Kenwood Depot, 314 Warm Springs Road, Kenwood. 707.833.5190. www.kenwooddepot.com.—G.M. It was a day of a gajillion weddings—07/07/'07—and avid people-watchers in Sonoma Plaza were treated to not one, not two, but five groups of wedding parties for their weekend gawking. Nowhere is the mystery of human intention more entertaining than in a group of wedding celebrants. How did the bride and groom meet? Which bridesmaid secretly hates which groomsman, and will they patch up their grudges in the sack tonight after too many drinks? Who in the world picked out those colors, anyway? By all measurements, however, the people-watching award goes to the giggling group of bridesmaids who tinkled out of the antiquated lobby of the 19th-century Hotel Sonoma and onto the Plaza sidewalk wearing nothing but white terrycloth robes. "Where's the limo?" squeaked the leader, while several others clutched Champagne glasses, gabbing about hair, makeup and the sorts of things that bridesmaids gab to each other about. Soon, said limo pulled up, the blur of lipstick and curlers hopped into its doors. It was all over in a matter of seconds, but damn! Hotel Sonoma, W. Spain St., Sonoma. 800.468.6016 .—G.M.